Apple has sold 50 million iPhones and 35 million iPod touch devices, so there are a lot of people who can benefit from these secrets. This is by no means a complete list, but I wanted to provide some of the most useful and least well known iPhone tricks. Most of this list also applies to the iPod touch; if you know someone with one of these, be sure to send them a link to this article. The button on the front of the phone is called the “home” button. You can choose what happens when you double click it. Mine is set to go to my phone favorites, making it quicker to dial my people. You can get to this screen by going to Settings > General > Home. 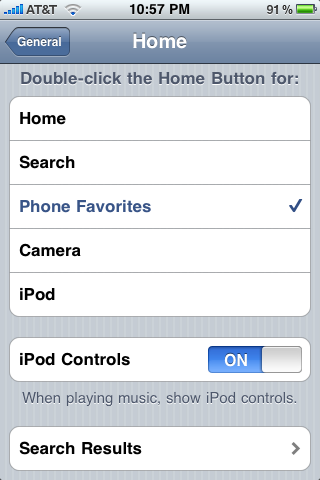 As you can see on the option screen above, there is an option for “iPod Controls.” When those are on and the phone is in standby mode (blank screen), you can double click the home button to see the current song/artist/album cover and show audio controls (volume/forward/back/play/pause) — see below for example. If you want to fast forward or rewind, hold the forward/back buttons respectively.